HARRISBURG, PA (August 22, 2017) – Cirque Italia, a traveling water circus production featuring acrobatic and skill-based acts with an aquatic backdrop, has scheduled eight performances at Harrisburg Mall from Thursday, September 21 through Sunday, September 24. Harrisburg Mall is located on 3501 Paxton Road off Exit 45 in Harrisburg. Advance tickets can be purchased by calling 941.704.8572 or by visiting www.cirqueitalia.com/tickets. For additional information, call 717-564-0980 or visit www.shopharrisburgmall.com. 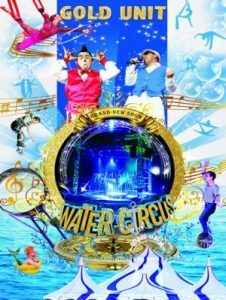 Cirque Italia is an Italian entertainment company that performs aerial acts, hand-balancing and contortionist moves inside or above a tank containing 35,000 gallons of water. Founded in 2012, the troupe has performed in twenty-five different countries and appears before two million people each year. Featured entertainers include twin Argentinian jugglers that have earned Guinness World Records, Alex the Clown’s acrobatic performance on a trampoline and futuristic laser acts. Harrisburg Mall is a one million square foot regional mall with more than 70 tenants, including anchor stores Macy’s and Macy’s Backstage, Bass Pro Shops, Destination XL, 2nd & Charles and Regal Cinema’s Great Escape Harrisburg Mall Stadium 14. Baltimore-based St. John Properties, Inc. owns and manages the property.